Lindy Smith’s decision to part with Bahnhof Sport shop in Petoskey wasn’t easy. After all, the Bahnhof was a part of the Smith family for three generations since opening in 1963. For new owners Don Marszalec and Anna and Jason Dunn, the decision was a sound one, based in large part on Don’s familiarity with the store and its customers, and vice versa—given Don’s 17 years of ties to Bahnhof Sport, it’s almost like keeping it in the family. “It’s not easy to sell a ski shop. This is a good way to exit,” Lindy says. The Bahnhof story actually dates back to World War II, when Lindy’s father Lionel was a member of the 10th Mountain Division in the U.S. Army, famed for its exploits in the snow-covered mountains of Italy and Austria. He taught winter survival and how to shoot a gun on skis. 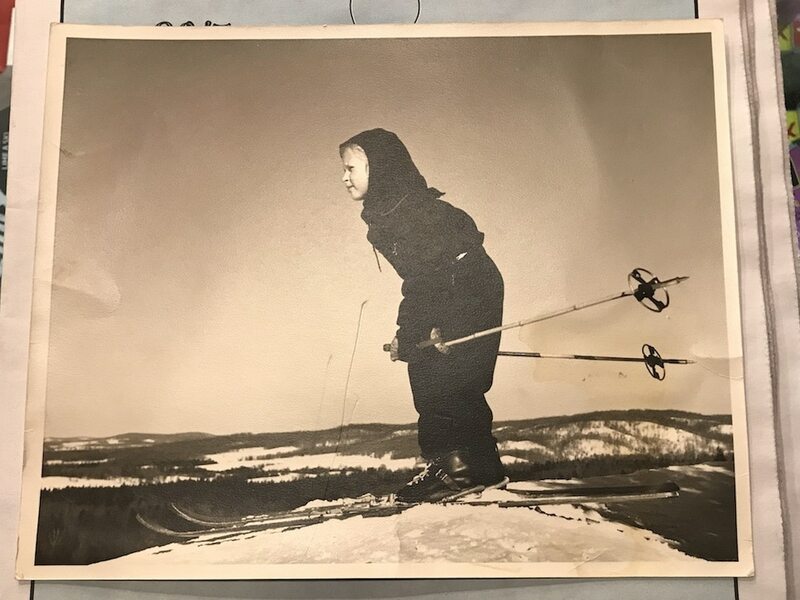 Lindy Smith skiing when she was a child. When he returned to the States, the family settled in Detroit, where Lindy was born. The family moved north to Gaylord when he was tapped as the director of the ski school at the Otsego Club & Resort. “I don’t recall learning how to ski, but (it was) before I walked,” Lindy says. While Lionel was busy on the slopes, his wife Virginia took control of the Yodeler, the on-site shop for skis and apparel. At the end of the season, they’d carefully pack away unsold items for the next year, but it turned out their patrons wanted new equipment, not last year’s models. So the Smiths rented space at the old train station in Petoskey’s Pennsylvania Park to sell the previous year’s equipment. (Bahnhof means “train station” in German.) “The members wanted to see all new stuff. The Bahnhof was the outlet for the Yodeler,” recalls Lindy. Fast-forward and the Bahnhof concept grew with the next generations. Lindy, her husband Greg, and their son Ryan eventually presided over 18 stores located in Wisconsin, Colorado, Utah and Michigan. Among the employees was Don Marszalec, who worked at the store in the winter and at Boyne Mountain in the summer. He loved the work and the people, but after 16 years he decided he preferred one full-time job to two part-time jobs, and he took a post with Boyne. He eventually landed at Big Sky in Montana, where he spent the last 22 years with Boyne Resorts as director of retail. He retired from Boyne this year and returned to Michigan to be with his father. In the meantime, he’d become acquainted with Ohio residents Jason and Anna Dunn, who were both originally from Northern Michigan. After Greg Smith passed away in 2003, Lindy began to consider downsizing. 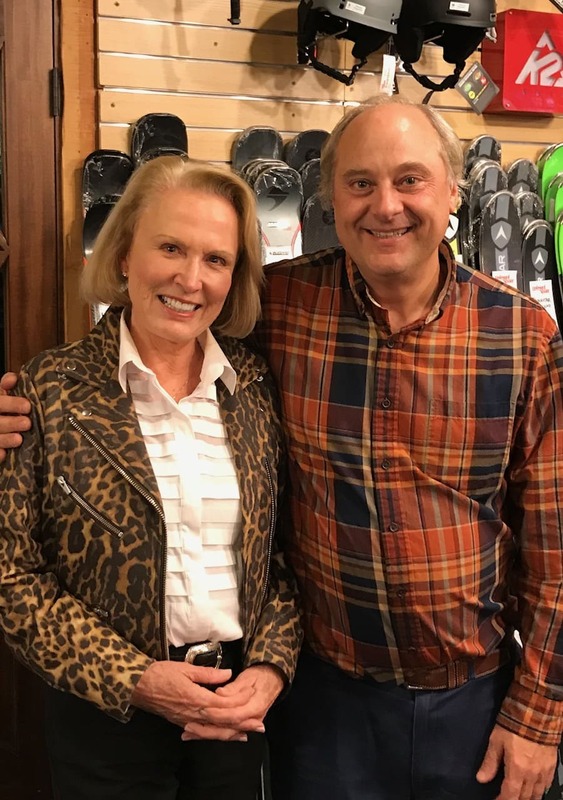 Over the last several years she sold the Bahnhof shops until only two remained: one in Park City, Utah, and the flagship store in Petoskey. When Don got wind of Lindy’s plan to sell the Petoskey store, he turned to his friend Jason, who had just sold his plastics company. Marszalec is now running the Petoskey shop (the Park City location was sold to R&R Sports), and he’s looking forward to the rest of the winter and then the summer, as the Bahnhof embraces that season as well. “In the summer we rent bikes, kayaks, stand-up paddleboards. Bike rental is huge for us,” he says.